Join Tom, Chad and the Cascade Kayak School crew for spring training! New for 2012, this clinic will address advanced river running techniques, play-boating skills, and approaches more difficult whitewater. 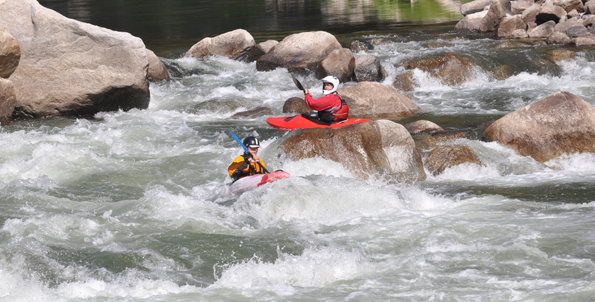 Tired of the Main, but don’t feel like you have the skills to try the South Fork? Want to move from surviving Slalom to stylin’ Staircase? Know Blackadar as the guy named Walt and not the rapid after Big Falls? This is the weekend you need to boost your skills for the summer boating season. Two days of focused instruction, new paddling companions, and sweet kayaking on the Payette River. See you there! Join our instructors for the Advanced Kayaking Workshop!